While writing our Vodka State of the Union from last week, we had a heated discussion in the office about the changing nature of product definitions in beverage alcohol. As a company who takes great care in defining trends and categories, it was one of those interesting discussions which lead us to some new thinking. So we're following up this week with some additional thoughts and questions from our SOTU. We started the office conversation at first about the evolution of the terms 'craft' and 'value' for spirits. Specifically, we wondered whether or not the success of Tito's is part of something greater where the term 'craft' is in danger of losing its specific, literal meaning and perhaps morphing into something completely different. Also, does the success of what we call 'hip value' in vodka (New Amsterdam and Svedka) and the parallel decline of Smirnoff mean the terms 'value' and 'premium' have blurred and now mean something completely different as well? Let's start with the data. In our proprietary DrinkTell™ database, our vodka price segmentation is straightforward. Our price-tier data is broken down by Value ($10.99 and below), Premium ($11.00-$16.99), High-End ($17.00-$26.99) and Super-Premium ($27.00 and above). We see price as a fundamental indicator of brand strength and perceived value and is the backbone of how we segment the market. As of 2017, Premium brands accounted for 40% of volume, Value 31% with High-End at 17% and Super-Premium at 12%. Since 2011, Premium brands have picked up 3% share while Super-Premium has also picked up 3%. In parallel, Value has lost 3% share and High-End has lost 3%. Consumers are trading out of Value into new affordable options in Premium and out of traditional High-End and into Super-Premium. This evolution of the market isn't surprising relative to trends we're seeing across the beverage industry. We think in vodka traditional definitions outside of straight price tiers have evolved rapidly in recent years, leaving new ideas in charge and many of the big players flat-footed. Tito's (ostensibly craft) and New Amsterdam and Svedka (hip value) are the three brands which have dominated the conversation in this new frontier. By focusing on two new ideas, 1) a brand can be local and authentic, and 2) that a good mainstream brand need not be expensive, these three brands have turned the international producers on their head. In our DrinkTell™ database, these three brands represented 113% of industry volume growth from 2011 to 2017. That means if you aren't one of these brands or operating within the new concepts created by these brands, you're probably losing share. So that's clearly where the consumer is and will likely keep going as we pointed out last week. As successful as Tito's has been, the issue of a real craft definition remains unsolved for us. There are complicated views on the issue of craft definition in spirits, resulting in several lawsuits and state-by-state goalposts too lengthy to list here. There is extraordinary flexibility in craft definitional interpretation in the market as well, enough to wonder if the term has real meaning. 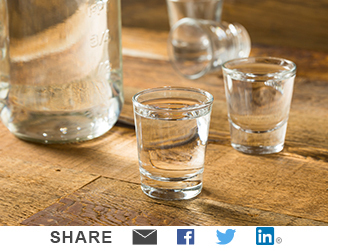 For the purposes of landing on a usable definition, the American Distilling Institute guidelines state that: "Craft spirits are the products of an independently-owned distillery with maximum annual sales of 52,000 cases where the product is PHYSICALLY distilled and bottled on-site." However, Tito's has become the flagship craft brand. Under that ADI formal definition, 52,000 cases is not a lot of volume and certainly Tito's - which makes the direct claim that it is "America's Original Craft Vodka" - has far outstripped that. We would note that any future successful craft spirit contains the seeds of its own message destruction if it is forced to plateau at 52,000 cases. So what's the point of claiming craft? With that in mind, does 'craft' ultimately mean anything to the consumer if the leading 'craft' vodka brand sells 5.3 million cases annually and does not remotely fit the traditional definition? The most obvious comparison is in beer where Blue Moon sells two million barrels annually. We believe the vast majority of casual beer drinkers perceive Blue Moon as a craft, or at least it is craft enough for their purposes. That sounds a lot like where Tito's is today, craft enough. That's certainly working for them, but leaves the definition of craft up in the air. Diageo and Pernod aren't built to chase craft, but are built to chase the new 'hip value' positioning tier and neither has unlocked the formula yet. New Amsterdam is marketed by a big manufacturer (Gallo) and makes no craft claims. It's not specifically a Value brand under our price-tier definitions but it is at an affordable discount to the market leader. New Amsterdam is not an international mega-brand, it's not imported and the brand does not behave like a traditional Value brand as it is well supported by media and its packaging is on par with more traditional mainstream or super-premium vodka brands. We came to a similar conclusion with Svedka. So what does mainstream/premium/value mean if two of the most successful brands can pull off mainstream and arguably premium imagery at a price discount to the leaders? Can Diageo or Pernod Ricard absorb the pain of lower pricing (and lower margins) to blunt the market share absorbing Hip Value players? We haven't seen it yet. Ultimately, for the spirits consumer at the point of sale, will the term 'craft' ultimately evolve into a short-hand for products which aren't imported, aren't international mega-brands and aren't traditional generic value plays? Or are the lines now so blurred across image, pricing and perception that are we simply unable to pigeon hole many relevant brands, making definitions outside of price irrelevant? In the end, are we just back to individual brand strength and innovation combined with price and availability driving the long-term winners? Not surprisingly, that turned out to be our final conclusion. If the ambiguity around craft persist long enough, the classification will eventually become meaningless. It was a fun conversation.